Geomorphology is part of Earth Sciences and is best described as the scientific study of landforms, their assemblages, and the processes that moulded them in the past and that continue to change them today. Geomorphologists study the shapes of landforms and the regularities of their spatial distribution; they decipher their origin and evolution, and try to establish their ages. Geomorphology has also been dubbed the ‘science of scenery’. Thus, the scenery – the combination of landforms and water – has become a subject of scientific inquiry. Geomorphology is also about the interpretation of natural landscapes and, in the context of World Heritage properties, it helps us to understand what brought about their uniqueness and their rarity. 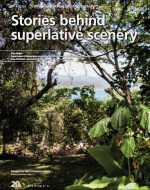 Read the whole paper published by World Heritage Review magazine published jointly by UNESCO and Publishing for Development (printed four times a year in English, French and Spanish). The publication presents and promotes the preservation of our World Heritage, with detailed feature articles and news items about the most outstanding cultural and natural sites in the world.